It's Christmas Time And We Have Hi-Fi Gifts To Suit All Budgets! We've got all sorts of Hi-Fi goodies in store for the music lover in your life to give as a major present, stocking filler, or just to treat yourself for Christmas! Here's Boswell with a small selection for your perusal. We have of course all of the other B&W headphones for you to try. Or how about the fabulous Chord Mojo portable headphone amplifier and DAC currently available with a FREE leather carry case. (Offer ends 05-01-2017). Non Christmassy colours are available! If you listen to your music on vinyl, there is also a wide variety of accessories for your turntable. From a little carbon fibre brush to keep your most prized needle sparklingly clean, through record cleaning brushes, new cartridges from Ortofon and Rega, and the wonderful Project VC-S record cleaning machine. We even have record players for under £200. Of course we also have our full range of excellent electronics and speakers to choose from and don't forget our Big Red Sale Winter sale has started, so there are some fantastic savings to be made! We'll take this opportunity to wish you all a peaceful and merry Christmas and look forward to seeing you over the holiday period. Paul, Francis, Jason and, of course, Boswell the bear. 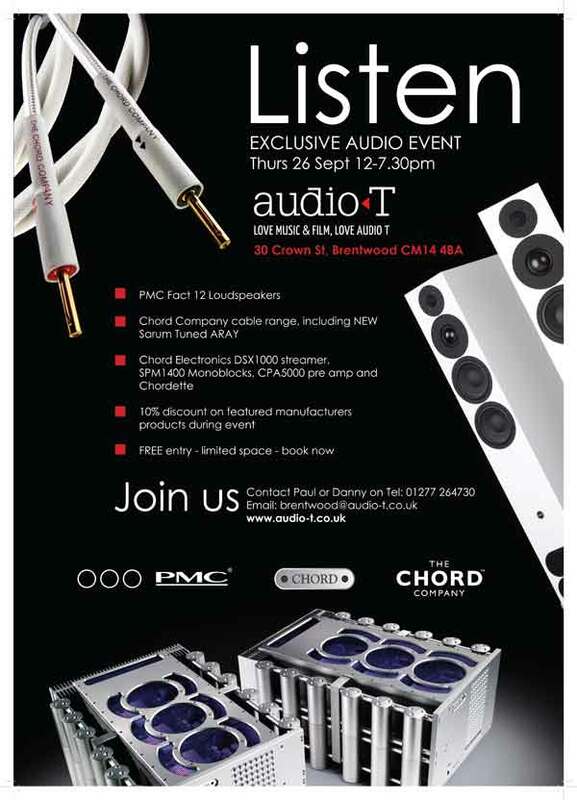 We're having a two day event showcasing Cyrus Audio products and Chord Company cables on the 4th and 5th of November. We'll have a range of Chord Co. cables to show off alongside Cyrus electronics including the brand new Cyrus One amplifier. We'll have multiple sources so feel free to bring some of your own music in whatever format, no cassettes or minidiscs please! We'll also have some nibbles and drinks available. We'll look forward to seeing you. Join us on Friday 30th September (12 noon - 5pm) and Saturday 1st October (10am - 4pm) at Audio T Oxford, when we will be running a music event featuring the new cable ranges from The Chord Company. The Chord Company has been designing and producing cables for Hi-Fi and home cinema systems since 1985. Recently The Chord Company completely restructured its cable line-up, with new ranges, new additions and a simplified grouping system. The Chord Company’s product portfolio now comprises seven distinct ranges, from the entry-level C-series, to the flagship, ChordMusic cables. The new ranges make it easy to discern between price points and performance levels and offers consumers a high-quality Chord cabling solution, regardless of budget. So come and join us to take a trip through the new Chord Company cable ranges and see how this most cost-effective of upgrades can work wonders with your system. We will be demonstrating new Interconnects, speaker cables, power leads and digital audio cables (coax & ethernet) from the C-Line range through to the Signature Range. This is a great opportunity to hear how much you can improve the sound quality of your system in a friendly and informal way. It really is one of the most cost effective upgrades you can make to improve the sound quality of your Hi-Fi system that will have you rediscovering your entire music collection. Refreshments and snacks will be served. Over the two day event we will be more than happy to answer any questions you have and also you will be able to borrow the cables to try at home in your own system. There will be exclusive special offers for attendees in over the two days. We look forward to seeing you....Jon, Dom and Paddy. Chord Company: Friday September 30th & Saturday October 1st. Chord have introduced their biggest changes to their range of interconnects, speaker cables and mains leads. A representative from Chord will be on hand to guide you through the new ranges and offer advice on how best these can be utilised to transform your existing system. More details to follow shortly. IsoTek Mains Conditioning: Friday November 4th & Saturday November 5th. Are you hearing your Hi-Fi at its best? The answer is probably no. IsoTek will be showing you how to transform the sound quality by ensuring that the quality of the mains feed is uncorrupted. More details to follow. Vinyl and Valves: Friday November 18th & Saturday November 19th. Henley Designs will be bringing a selection of gorgeous Unison Research valve, valve hybrid amplifiers, CD spinners, plus some of the more exotic Pro-ject turntables. If you really like your music, you really should come along for a listen. More details to follow. We're having a few fun musical events/ open days in Brentwood during November. On the 20th REL will be visiting with some BIG subwoofers to show how much can be gained by adding those lower registers to both HiFi and home cinema systems. We'll also have the projector room set up with a Dolby Atmos system for your delight and delectation. This will run in store from 12 noon until 8PM, be sure to come along and prepare to be impressed. Then on the 27th we will have systems from KEF, The Chord Company, Chord Electronics and Project running again from 12 noon until 8PM. Chord Electronics are promising some meaty amps (alongside current favourites like the Hugo and Qute DACs) to drive the Blade 2 from KEF. There will also be some new KEF Reference speakers, Chord Company Tuned Aray cables and one of the top flight Project turntables for some vinyl delights. We're looking forward to seeing you and tempting you with some wonderful sounds and equipment....and maybe a bargain or two! Francis and I were invited down to the Chord Company factory in Salisbury to see all the efforts that go in to making some of the best cables around. The day started with a good old fashioned chat with the cable guru himself: Nigel, then a trip round the factory to see all the processes involved in hand terminating and testing the interconnects and speaker cables. This culminated in them letting us loose with the soldering irons and cutters to experience actually terminating cables ourselves. With a deep respect for the skills of Mike and the Chord workshop elves and an amazement at the attention to detail and accuracy of the work we headed off, without burned fingers!, to a great in house lunch cooked by the lovely Gillian. The afternoon was spent with Matt who took us through a structured dem of the whole Chord range, I'm sure many of you will have seen him do this at The Bristol Show, but it is always a revelation how much more could be heard every time the next cable up was inserted into the reference system. It's not just the physical cables that are brightly coloured, they reveal layer upon layer of tonal colour as you go up the range. After a good afternoon's listening we left with a much deeper appreciation, both of the effort that goes into the creation of these cables, and the effect they can have on a system. The other thing that really struck home about the Chord company is that it is full of genuinely nice people who care about what they do, and just as importantly are passionate about music! So nice were they, that they even had a surprise for Boswell Bear which he is thrilled about! Come and join us on the 26th of September for a feast of music delivered by some of the best equipment the UK has to offer. We will be marrying together PMC loudspeakers, Chord Electronics, and Chord Co. cables for your delight and delectation. Chord Electronics will have the awesome SPM 1400 monoblocks, DSX1000 streamer and CPA5000 pre-amp. Along with examples of their Chordette range and more. The Chord Co. will be linking all of this together with their usual flair and great cables including some of the new Tuned ARAY cables. Come and join us for some music, some fun, and some great equipment, we will be offering a discount on purchases from the three manufacturers on the day. We start at 12.00 mid-day and go on to 7.30PM.